Own a budding new brewery? Successfully crafted brew for decades? Freshly minted nano-brewer? Share news about your latest hoppy libation by throwing a beer release, a prime opportunity to gain new customers and reward existing fans. Beer releases become market research labs. Tune into customer feedback and gain valuable insights into their preferences and tastes. Bonus: These events just might spur new beer batch ideas. Beer release locations are key. If your brewery holds capacity for guests, this would make a spectacular location. Need a space? Reach out to some of the businesses you sell to. 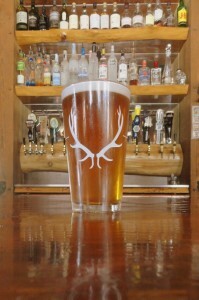 They will have incentive to help advertise new beer to sipping enthusiasts. A win-win. Pick a venue that fits your company or brewery personality and offers a setting suitable for coiffing your brew. 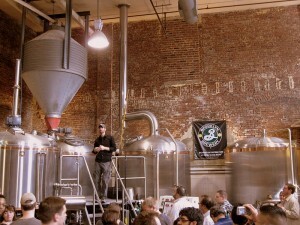 Venues set the mood for your beer release. Provide the venue with branded swag and signage a few weeks prior to the event so the place can advertise for you. Note: Distributors often take care of this step for larger breweries. Don’t let this slip through the crack for your release. Keep your beer release simple. The fewer moving parts to an event the easier it is to engage your fans and enjoy the ride. After all, the main attraction is drinking beer. Arrive well before the event to set up, prepare for last-minute (or unexpected) logistics and be ready for loyal fans. Bring giveaways. Make sure you are open and available to speak with everyone. Attendees adore opportunities for face time with brewers and owners. Put your social game face. Beer releases where you circulate also open you up networking possibilities that could boost your business. Make sure a brew master or official representative who has intimate knowledge of the beer is there to chat with attendees. Prepare for questions about chemistry, ingredients or equipment. Chances are home brewers and beer geeks will attend and they are as passionate about the craft as the final product. Drawings interest any audience. Give away pint glasses or t-shirts and you not only give a gift, but the receiver can advertise for you every time the gift is used. Tasting together with your customers allows you to you add depth to your brew by giving insights. Talk about the different spices and ingredients. Point out key notes that your fans should be tasting. Themed trivia is also another way to captivate eager beer lovers. Study your audience over the course of a few events and bring back interactive favorites at your next beer release. Tags: Beer, beer release, brewery, craft brew.